Freckles are small patches of light brown coloured skin that can start appearing at ages 1 or 2, caused by concentrated melanin. Freckles are common on the cheeks, nose, upper shoulders and arms. Q: Are you likely to get freckles? Not everyone can “get” freckles. These are hereditary so you either have them or you don’t. If you do, you can get more by being exposed to the sun and, if you don’t, the only way to get them is with the use of cosmetics. Q: Are there health risks associated with freckles? 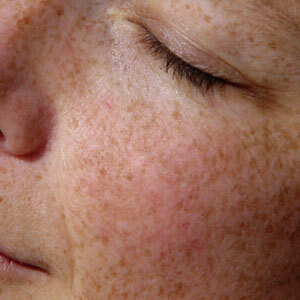 Freckles are essentially harmless, and only in very rare cases do they develop into skin cancer. It is possible to get rid of freckles, even though a lot of people choose not to as they aren’t usually unappealing. People with freckles need to be extra careful with the sun and, if they choose to, they can remove them with laser treatment.